Fan-filmed video footage of IRON MAIDEN's April 29 performance at Festhalle in Frankfurt, Germany can be seen below. 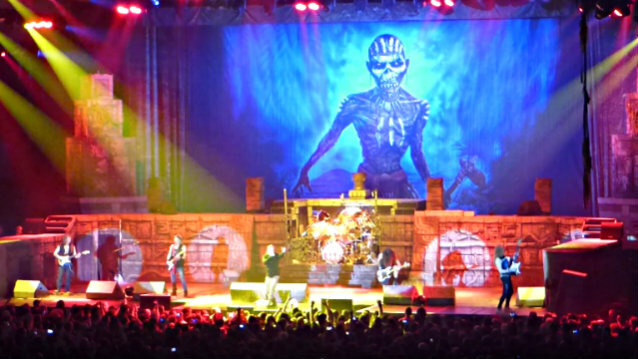 MAIDEN's European tour consists of a total of sixteen dates, including three shows in Germany, eight in England, two in Scotland and one each in Ireland and Wales. The U.K. leg marks MAIDEN's first full UK arena tour in six years. The German leg will see MAIDEN also perform in Oberhausen and Hamburg before dates in Nottingham, Manchester, Sheffield, Leeds, Newcastle, Liverpool, Birmingham, London, Glasgow, Aberdeen, Cardiff and Dublin. SHINEDOWN is providing support act on all sixteen dates. Prior to the tour, IRON MAIDEN bassist Steve Harris said: "As it's been so long since our last full U.K. arena tour, we really wanted to get to our fans in as many cities as possible. We're really looking forward to it, especially visiting places we haven't been to for a very long time, like Leeds, where we haven't played since 2005, and Liverpool, where we haven't played since 1990. "The whole band is really enjoying this tour and although we love playing festivals and stadiums, it is terrific to return to the intimacy and atmosphere of arenas. "The songs from 'The Book Of Souls' album and the new Maya-themed Eddies and stage sets have gone down really well and fan reaction has been amazing. And, of course, we know our fans appreciate us playing a lot of the older songs too, which we will continue to do."